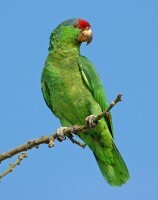 The coastal plain of eastern Tamaulipas State in Mexico supports isolated populations of two globally endangered Amazon parrots, the Yellow-headed Amazon (Amazona oratrix) and Green-cheeked Amazon (A. viridigenalis), and healthy populations of the Red-lored Amazon (A. autumnalis). A. viridigenalis has a small range and is found only on the Atlantic slope of north-eastern Mexico. In the 1990’s intense studies of these species in the Tamaulipas region, focused on 550 ha of the Los Colorados Ranch, 5km from the Gulf of Mexico, were undertaken by Dr. Ernersto Enkerlin-Hoeflich, now of the Monterrey Institute of Technology and Higher Education, Mexico. 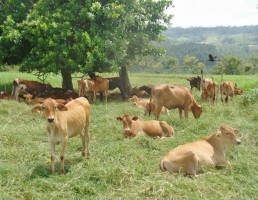 Back then, the research site was made up of a mixture of native woodland fragments, wooded pastures, and open pastures set in a broader landscape dominated by open pastures. The studies included counting parrots at large nocturnal roosts, and the calculation of nest densities, and provided important natural history and conservation information on these species. In fact it is still used in making conservation assessments, but there has been uncertainty about whether these species of parrots could persist long-term in this landscape highly modified by man. It was not known if the parrots had moved from recently deforested areas into this pastoral landscape or if they could sustain their populations in the pasture habitats. In the 20 years since the last work much has changed. Europe banned importation of wild caught birds in 2007 and Mexico passed a ban on the capture and sale of native birds in 2010. Both actions should have reduced the impact of the pet trade in the region. The region was heavily deforested by the early 1990’s, but the deforestation ban passed in the 1980’s has apparently reduced the rates of forest loss, because the region is no longer considered to be losing forest cover. Remote images of Google Earth show that there has been almost no loss of tree cover in the area from the early 1990s through 2011, suggesting that the habitat has remained relatively unchanged over the past 20 years. The reduction in deforestation and increased legal protection for wild parrots leads to cautious optimism about the fate of the wild parrot populations in Tamaulipas. However, enforcement of environmental laws is still weak and widespread illegal activity remains common. As a result, capture for the pet trade may remain high in rural areas like the coastal plain of Tamaulipas. During his work, Enkerlin-Hoeflich hypothesized that the three species of Amazona parrots would be able to survive in the highly impacted matrix of pasture with large isolated trees (about 85% of the landscape) and native forest fragments (about 15%) as long as poaching rates remained low. Testing the hypothesis that these Amazon parrots can survive in these highly impacted landscapes for > 20 years is of great importance to the conservation of these species, as it has broad implications for future conservation planning and landscape management. If true, it would suggest that work with ranch owners and their employees could go a long way to improve the conservation status of these birds in areas dominated by cattle grazing. Therefore the Loro Parque Fundación supported a follow-up project of Dr. Enkerlin-Hoeflich, together with Dr. Don Brightsmith of Texas A&M University, USA, to return to the same sites and repeat the methodologies to determine how the numbers of birds roosting and nesting in this field site has changed over the past 20 years. The immediate intention is to use the resulting information with other researchers to verify conservation status, set conservation priorities and create conservation plans for the endangered species A. oratrix and A. viridigenalis. Between April and July of 2013 the field coordinator, Jose Luis Manzano, conducted a total of 17 counts of the Amazon parrots as they arrived to roost in a forest patch in the same locality of the study area. On average 148 ± 38 parrots were detected going to roost. 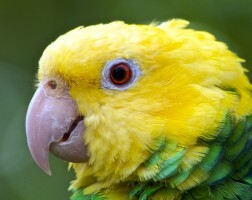 The numbers of parrots detected per evening were higher than the average over the period 1992 – 1994 and were most similar to the values from 1992, the year with the highest counts from the original study. These results indicate that after 20 years the parrots are continuing to use this area successfully. The numbers of Yellow-headed Amazons coming to roost were much higher than the values recorded during the same months in 1992 – 1994. Throughout the 2013 season the roost counts averaged 85 ± 20 individuals per count which is much higher than the average of less than 15 from the same time period in 1992 – 1994. This finding is quite surprising given the reported grave status of this species in many areas of Mexico. The numbers of Green-cheeked Amazons were relatively high in April (70 individuals), but by May they had dropped to very low levels (3 ± 5 per count). The average value per count for 2013 (12 ± 17) was significantly lower than the average over the same period in 1992 – 1994 (29 ± 26). However, while these numbers are very low, they are similar to those recorded in 1993 and 1994. Therefore this species persists in this environment even though it has not shown the dramatic increase in numbers over the last 20 years like A. oratrix. The numbers of A. autumnalis coming to roost were about 20% higher in 2013 (40 ± 10 per count) than over similar date ranges in the 1990’s (33 ± 13 per count). To examine nesting densities, Jose Luis Manzano surveyed an area of 258 ha between April and July 2013, to locate and confirm parrot nests. The project located a total of 19 confirmed nests and an additional three probable nests. The most abundant nester was A. viridigenalis with eight confirmed nests, followed by A. oratrix with six confirmed and two suspected and A. autumnalis with four confirmed and two suspected. Using the 258 ha, the estimated nest densities were 7.0 (confirmed) to 8.5 (suspected) nests per 100 hectares for all three species combined. Confirmed nesting density per 100 ha was 1.6 nests for A. autumnalis, 2.3 for A. oratrix and 3.1 for A. viridigenalis. The nesting densities for A. oratrix were 270% to 360% higher in 2013 than the average during 1993 to 1998. This increase is real as during the 1990s research teams never found eight or more nests of this species even though they searched an area roughly twice the size of that searched in 2013. The nest density of A. viridigenalis, was about 36% higher in 2013 than in 1993 to 1998. This likely represents a real increase, although not nearly as pronounced as that seen for A. oratrix. The nest density for A. autumnalis in 2013 was nearly identical to the 6 year average (1993 to 1998). However, given the late start on the field season (April – May in 2013 versus February – May in the 1990’s) and the smaller field team, the expectation was to find lower numbers of nests in the 2013 season, especially for A. autumnalis which is exceedingly cautious around its nest making its nests much more difficult to find. Additional nest searching effort would likely pay off a great deal more in finding nests of A. autumnalis and for this reason it is suspected that the actual nest densities of A. autumnalis may also be higher in 2013 than they were in the 1990’s. However, the results clearly show that all three species are still surviving and nesting at Los Colorados Ranch. Another factor is that the region is still in the grips of a serious drought, which began in 2010. Nevertheless, the visits to the research site confirm confirm the similarities in the 1993 habitat map and the 2010 Google Earth images. The nest data from 2013 show that there is still some nest-poaching happening, however the Los Colorados Ranch owner, as a result of his interest in the repeat project, now receives reports from his manager so as to maintain control of these kinds of activities on his land. This is good news for the Amazons of Tamaulipas.